Banana bread is a snack-time favourite. 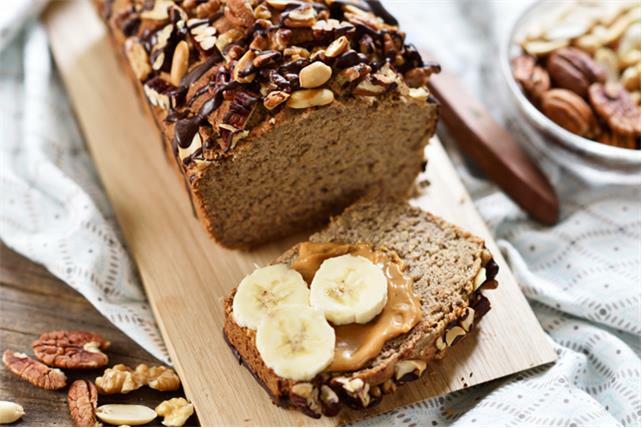 Our banana bread featuring Philadelphia Cream Cheese and ripe bananas is sure to become your new favourite go-to recipe. Stand 2 (9x4-inch) pieces of parchment along long sides of 9x5-inch loaf pan; grease bottom of pan. Combine flour, baking powder and baking soda. Beat cream cheese, butter and sugar in large bowl with mixer until blended. Add bananas and eggs; mix well. Add dry ingredients; beat just until moistened. Pour into prepared pan; top with nuts. Bake 1 hour or until toothpick inserted in centre comes out clean. Cool 5 min. Remove from pan to wire rack; cool completely. Melt chocolate as directed on package; drizzle over bread. Let stand until firm. Spread banana bread slices with Kraft Smooth Peanut Butter, then top with banana slices. For best flavour and moistness, use overripe bananas when preparing banana bread. Store fully ripe bananas in freezer-weight resealable plastic bags in freezer. When ready to use, remove bananas from freezer and refrigerate 1 to 2 hours or until thawed. The parchment paper is placed in the loaf pan to help contain the batter in the pan as the bread bakes.